One of the requirements when we acquired KISSinsights was that we change the name. As much as we loved the KISSinsights’ name, a new name would gives us the flexibility to extend beyond collecting insights. Having been through naming exercises several times, I realized it would be an opinionated, emotional process. All startups want a name that will help success, or at the very least won’t stand in the way it. And unlike most startup decisions that are temporary and iterative, naming is a lot harder to reverse. So we began our renaming exercise with some trepidation. Like most companies, we were tempted to go with a cookie cutter name. Finalists included SnapTabs and BuzzBits. Our VP of Product, Jason Meresman, suggested Qualaroo. My initial reaction was “We can’t have a name like that!” It went against my conservative nature to blend in… Then I realized that blending in is the last thing a product should want to do. Jason laid out a compelling case for Qualaroo. Of course, like all important decisions we wanted to get input from some customers and peers. We shared several potential names and asked for feedback and/or suggestions. Most people had the same reaction that I initially had. They gravitated to names that sounded “ordinary.” A few people sent persuasive support for Qualaroo, but they were in the minority. So we were left with the decision to go with a safe, cookie cutter name or something more distinctive. 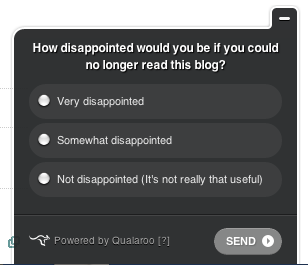 Not surprisingly, we chose Qualaroo. It seems to strike the right balance of whimsical and serious. And most importantly, tests show that people really remember it. This entry was posted in Branding, Naming by Sean Ellis. Bookmark the permalink. It’s a nice name, and I love the logo. I like the connection with “qual,” but the only downside I can see is potential confusion in terms of spelling. People may assume it’s “Koalaroo” or something like that. But the “roo” is a nice addition! Thanks. We jumped on most of the misspellings, but that one wasn’t available. Qualaroo is much more unique than the hundreds of product / service names ending with ‘ly’ and ‘fy’. Unique and catchy name! This has got me curious — how’d you test memorability of the name? I definitely respect the uniqueness of this name. Current web apps/companies do have a very cookie-cutter feel to them, so much so that I broke down a lot of the common prefixes/suffixes into a series of “suggestions” in my http://namevine.com/ tool. Compound names (buzz word + relevant word to your product) are great for weekend projects or as working titles, but if you’re in it for the long haul you need to create a really distinct brand. Thanks Mike. My testing was very anecdotal. I’d drop a name in conversation once and then ask people 10 minutes later what the name was. Amazing how most names were forgotten. Everyone remembered Qualaroo – even an older person who is a bit short term memory challenged. Logo looks great; I could see the kangaroo being a stamp on websites that consumers get to know. Names are so important, but so tough. My uncle wrote a non-fiction book about 10 years ago that got great reviews in the New York Times but was not a great commercial success. I am pretty convinced that the name the publisher chose for the book was the culprit. People just didn’t get it. Names on the Internet are different, but just as important. I think your testing method is probably a good one, but I guess the reality is that you’ll never be able to judge the success of the name by itself, because the name will live in the context of everything else you do to promote the service. Good luck with it! Agree with above, particularly Paddu on the common suffixes most web companies use these days. I like the choice of branding too – very memorable & extensible. I’m actually going through the same process with my company and would love to get your take. The site is purely in the content space and unfortunately the brand, URL, name does not allow for any flexibility or expansion at all. We have a new brand and name we’d like to change to, but as it’s purely a content site, I’m worried we’ll lose tons of SEO value. Any ideas? Thanks, I’m not much of an SEO expert myself, but my SEO expert friends assured me that a name/domain change doesn’t hurt SEO if done correctly. I’m reaching out to you to see if you’d be interested in a new online community called Startup Universe, powered by AtomicReach.com. The community includes expert advice, insights and ideas on early stage technology companies. We are reaching out to bloggers who write about technology, entrepreneurship, small business and financing that affect today’s rapidly changing startup environment. You can see it in action on Genwealth Venture’s blog (www.genwealthlp.com/news). Here’s how it works: If you choose to join, the title and first few sentences of each post will be published on Startup Universe. If a reader wants to see the full story, they’ll be pushed to your blog. The benefits to you are: increased exposure, traffic and a forum to share your thoughts and opinions with a large group of engaged writers and leading business experts. If you’re interested or have any questions, please send me an email at tinajin @ atomicreach.com with “Startup” in the subject line. Great and simple to test the name Sean. Think I will use that idea at the next meetup I attend for a service that I have wanted to launch for a while. My name is Alexandra and I am a senior at Seattle University and I just got through listening to your interview on Venture Hacks and was blown away. I know you probably get this a lot, but I’m 23 year old girl who slipped and fell in a hotel and came up with a solution to a $2 billion revenue killer in the industry. We were just mentioned by Forbes in their most recent August issue, which was awesome. But, we started this company on only $81,000 and have gained national distribution agreements….but the product’s simply not moving. Suppliers want to play the numbers game and send out a 100,000 flyers and simply wait to hear back. And from what I’ve gathered, if dealers/end users can’t get the product into their hands and test it for themselves, they aren’t going to be impressed by a flyer about a product they’ve never heard of, made by a company they’ve never heard of. We’re on the verge of raising more capital and trying to figure out what the best/low cost, most efficient way is to get this thing off the ground. Is there any way you might be able to chat for a few minutes about this? We can’t afford to hire someone to do this for us, but I am willing to do whatever it takes and hungry for knowledge and direction. Any counsel you might have would be incredible. Here is the link to the forbes thing so you can get an idea of how vast the need and market potential really is. It’s catchy and memorable. The downside we only realised after the fact is that in a competitive marketplace filled with low rent sites stuffing keywords into their domain, we have no chance to compete SEO wise for a long time. Wonderful! For nearly the exact reasons you mention, we named our start-up Gangaroo.com. Funny huh? We think it’s cute, easy to spell when heard by word of mouth, unique, whimsically non-specific, only one letter different than a popular marsupial. The seed idea for the name came from Gang and Guru. Sadly, Gangaroo as a startup is not working out. So we are selling the domain, now Page Rank 4 to boot. If you like Qualaroo, and might like Gangaroo. Reach out to us. Sean- as a new reader of your blog I love many of your ideas. However, i must say that when i click on the links to your past startups and see them dead end or point to Qualaroo…it makes me wonder about the longevity and practicality of what you propose. Iqbal, I’m glad you made this comment. I wish I had a magic formula that could make every startup idea successful. But the reality is that customers are the only ones that can determine if an idea is viable and they are very fickle. Throughout my blog I identify Product/Market Fit as the biggest risk for any startup. Most of my recommendations in this blog are for companies that have reached product/market fit. None of my blog posts give guidance on getting to product/market fit (I did however invite a guest writer to write one). My only guidance for pre-product market fit companies is to be very flexible and conserve cash. And I generally credit Steve Blank with helping me to understand why these things are important for pre product/market fit companies. Flexible/conservative execution is the approach that we have taken with our startup. We were able to pivot with the blessing of our original investors and required no additional funds. The revenue we are now generating with Qualaroo gives us several years of runway on the remaining cash we originally raised for CatchFree. And our decision to pivot to Qualaroo happened when we reached a fork in the road where it seemed the better opportunity. Our execution of CatchFree helped us discover the opportunity that has shaped our vision for Qualaroo. We are far from my definition of success at this point, but the story is still being written. And personally, I’m very enthusiastic about our prospects with Qualaroo. The lessons I share on this blog are based on a pretty good track record before Qualaroo. Six of the first seven startups I worked on reached valuations exceeding $100 million. And 3 of them have peaked at over $1 billion (and I’m confident that at least two of the others will get to $1 billion). I was the first marketer at five of these startups. So regarding the longevity and practicality of the approach I recommend, you should question it (as with everything else you read). But keep in mind, I share this information because I wish it would have been available to me. And I love discussion and debate it generates to help me evolve my thinking.